4 Italian pasta condiments ready in 10 minutes (or less) – KIMOMO Lab. Now it’s time to take another step: you need something to add to your pasta. In Italy we always serve pasta with a condiment, never have it unseasoned as a side. 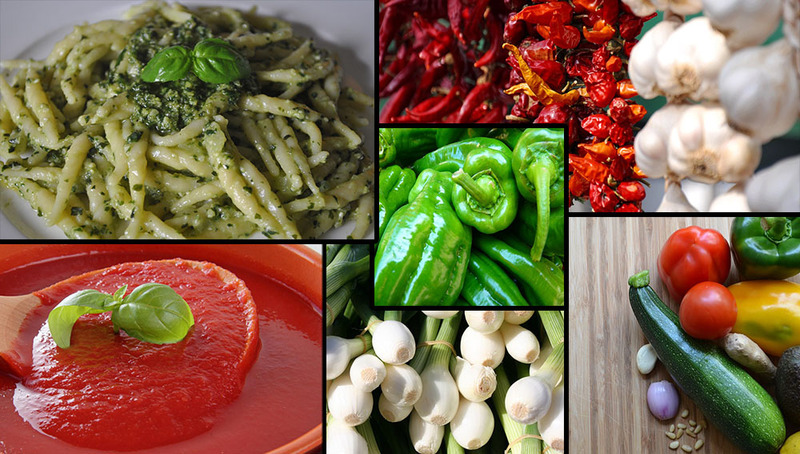 There are thousands of different sauces and condiments you can have with pasta; it is a very versatile product, in fact you can match it to almost any food: its delicate and balanced taste goes well with everything! 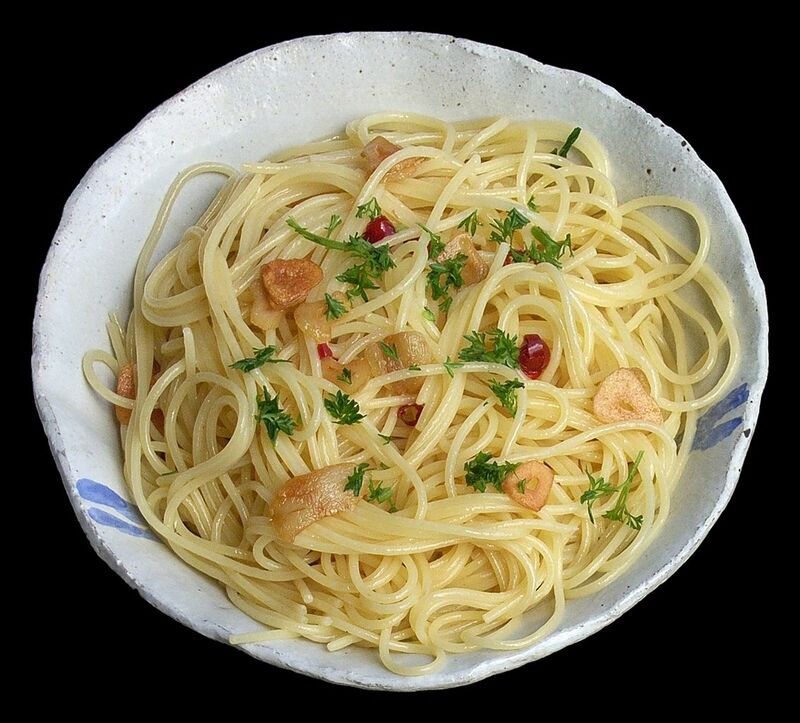 Italian cuisine is characterised by simplicity: most of its recipes require only four to eight ingredients. As long as you choose fresh and good quality ingredients, you will end up with a palatable dish. I recommend not to use ready made sauces. Not only they don’t taste as good as the real thing, they usually contain loads of preservatives, excessive amounts of salt and artificial flavourings. I know, I know… You are busy. Everybody is. What if I’d say to you that you can prepare a healthy condiment in less than the pasta’s boiling time? No joke. Of course, I’m not talking about elaborate, slow-cooked recipes. If you haven’t read my previous post, 10 Easy steps to cook perfect pasta, please do so: a nice sauce would be wasted on overcooked and insipid spaghetti. Surprisingly enough, there are a lot of versions of something as simple as tomato sauce can be. Well, maybe it is not so surprising if you think that tomato sauce is one of the basics of our cuisine, fundamental in the preparation of many Italian recipes. The best results are obtained starting from the scratch, from raw fresh tomatoes, but at this time we’ll use tomato purée – way faster to cook. Consider that the traditional recipe entails more than one hour of cooking time. After putting the water on heat for the pasta, cut lengthwise the garlic clove in halves and remove the internal, green part (do you know how’s that called? In Italy we often refer to it as the “soul” of the clove, no idea if that applies to English as well!). Anyway… put oil and garlic in a deep pan or pot, and start cooking over low heat, until the garlic is golden but not burned. If you like it, chop finely a small scallion or half a onion, and add it to the pan. I usually skip this passage, because I prefer only garlic in this particular recipe, though sometimes I add just a little scallion which is sweeter than onion. If you added the scallion/onion in very small pieces, you only need to wait about 10 seconds, and then add the tomato purée. Mix it well with a wooden spoon, then wash the basil leaves, take half of them and save the rest for later. Shred the leaves using only your hands, and put them into the sauce. Also add freshly ground black pepper, according to your tastes. I personally adore it, I add it to most dishes! Put a lid on the pot, but make sure it’s not completely closed as the steam needs to get out. Stir from time to time. Towards the end of pasta’s cooking time, add a few spoonfuls of boiling starchy water to the sauce and stir well; then add a pinch of salt, try and adjust accordingly. Your tomato sauce is ready, you only need to add the strained pasta and the basil leaves you saved, and sauté over low heat for one minute. You can prepare the sauce in advance and store into the fridge, but remember to reheat it and add the pasta water. Play with the recipe: You prefer not to use garlic but a lot of onion? Go ahead. You’d rather have a chunky sauce? Choose canned diced tomatoes and coarse chop the onion. Love spicy food? Add your favourite chilli peppers together with the garlic. Find out how you like it better. Use it as a base for a richer sauce: use whatever you like, from olives to meatballs, cooked vegetables or anything you can think of. 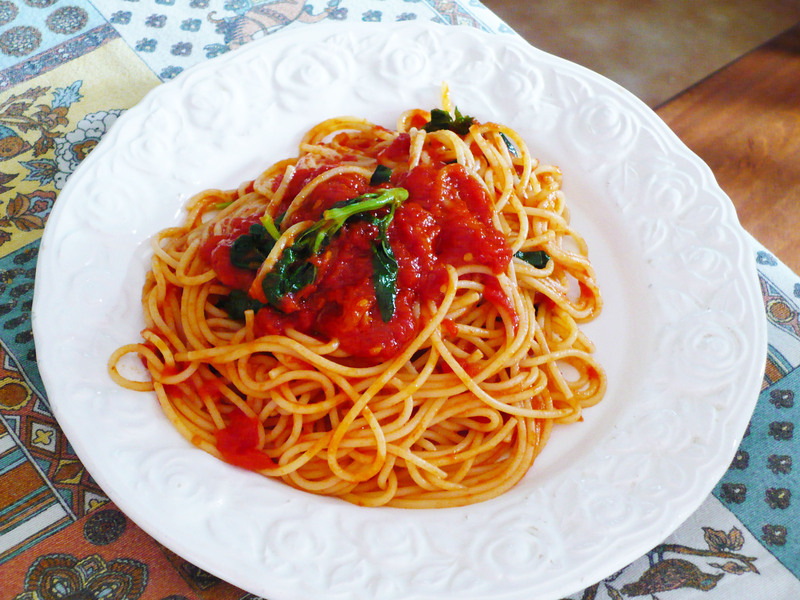 Top your tomato sauce pasta with grated Parmesan cheese. This is a delicious speciality from Genova, really easy to prepare. The idea l way of making pasto is by using a mortar, but it’s not something everybody has at hand, so I’m going to suggest (and get the wrath of the purists) to use an ordinary blender. Basil shouldn’t be cut with metal blades, because that makes them darker, so if your blender features a set of plastic blades, use them. If not… it’s not a huge problem really, just go ahead. Cut the garlic cloves in chunks and put it in the blender together with half the salt. Blend for a couple of seconds, or give 2-3 pulses. We want the garlic coarsely minced at this stage. Add the basil leaves and the remaining salt and pulse a couple of times to start shredding it. Now put in the grated cheese and the pine nuts, and blend briefly again. Finally add the oil, and give it the last pulse. I personally prefer when pesto is not completely smooth, I like the texture given by little pieces of garlic and pine nuts and the bigger pieces of basil. Of course, if you want it more uniform, just blend more. As regards the pasta, I suggest choosing linguine (sort of spaghetti, but flat) as for the traditional recipe, but you really can pick any shape you like. When your pasta is ready, just strain it and put it in a bowl (not in the pot, because it is still hot), add the pesto and stir thoroughly. That’s it! 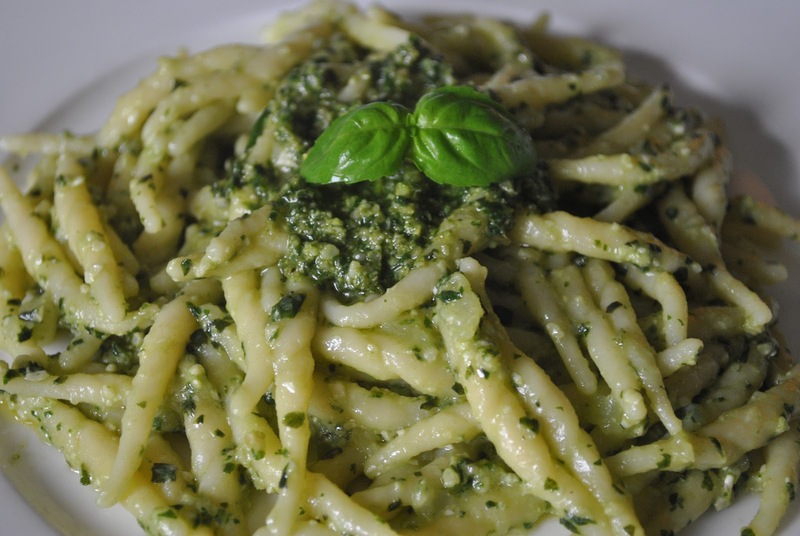 Now enjoy your fantastic pasta al pesto! I usually don’t buy ready-made sauces, pesto is the only exception to that: I always check the ingredients, the colour (it should be a vivid green), and prefer the fresh kind (you can find it refrigerated). I just discovered something new about this recipe. 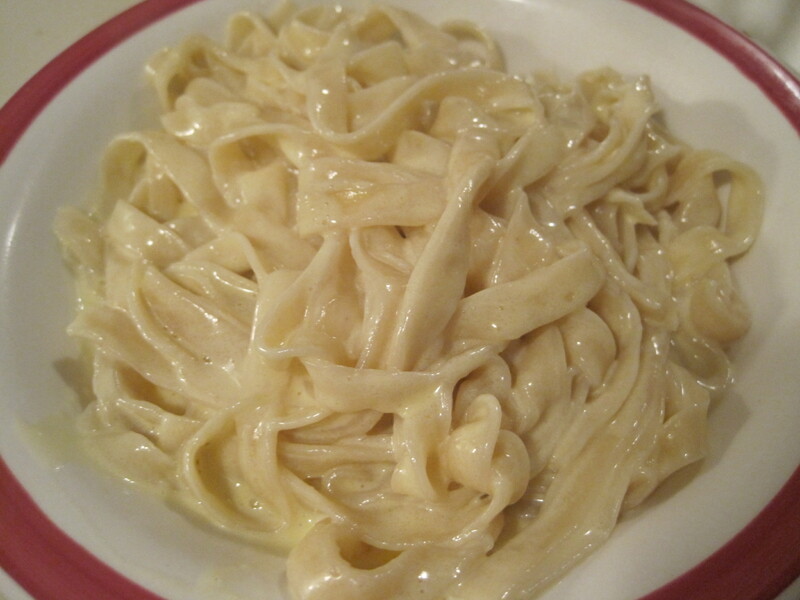 Have you ever heard “Fettuccine (or pasta) Alfredo”? Well, I just discovered that it is basically pasta with butter and parmesan. Before this day I came in contact with this recipe, I found it in several menus of Italian restaurants abroad, and I always thought it was not an actual Italian recipe. But apparently it is! So probably you already know what it tastes like. I recommend using fresh pasta for this recipe: not only it is tastier, but makes the water starchier, and we need that to give the right texture to the sauce. Towards the end of pasta’s boiling time, take about one glass of water a nd save it for later. Put the butter in a bowl, then strain the pasta and put it in as well. Stir thoroughly. When you’re done add the cheese and keep stirring, pouring some pasta water in it as needed: the cheese will melt and you will get a creamy sauce. Now taste it and salt, pepper and nutmeg according to your tastes. Extra virgin olive oil, 50 g – about 5 tbs. Being the preparation very quick, it is better if you start doing it while the pasta is boiling. Put in a frying pan one peeled garlic clove, the oil and the chilli pepper, only after slicing it and removing the seeds. Put over gentle heat. Now cut the other garlic clove into thin slices, and chop up the parsley coarsely. Take some pasta water and save it for later. When the whole garlic clove starts to get golden, remove it and put in instead the sliced one. Be careful not to burn them, and as soon as they turn golden take out of heat. Strain the pasta, put it back in the pot over low heat, and then add the water you saved, the chopped parsley and a pinch of salt. Wow, thank you for this post!!! I love Italian food and adore pasta. Gonna try all of them, but I’m especially curious about the pesto, it looks yummy! I also read your post about boiling pasta… it really works! My pasta now is way tastier than before, thank you!! I agree with Ned, am a pasta lover myself. 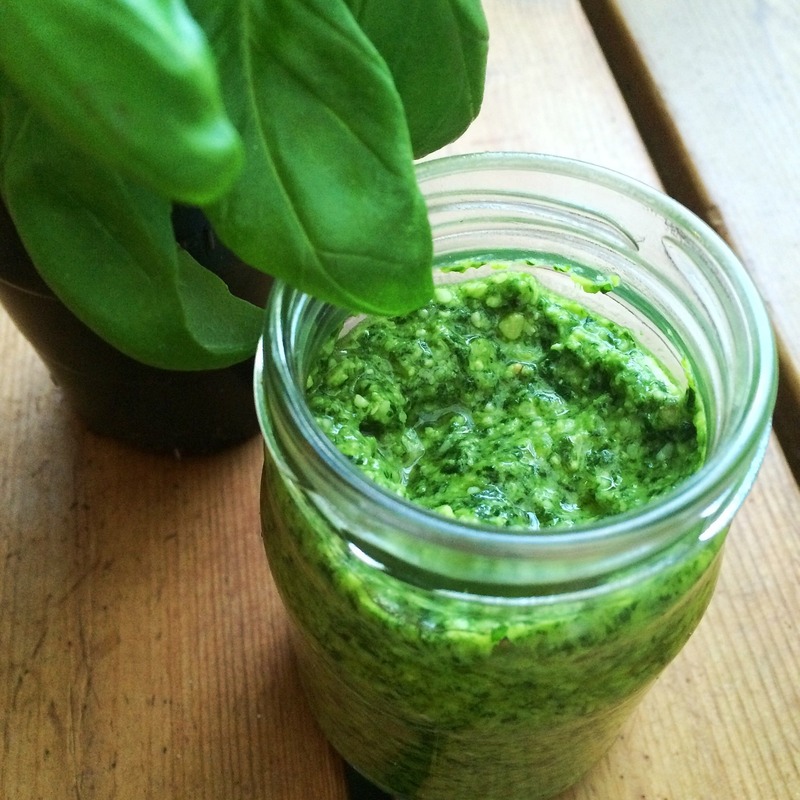 I’ve been lucky enough to visit Italy and taste real Italian pesto… It is nothing like the ones you could get in stores. I can say now pesto is my favorite thing ever! I like the sicilian red pesto as well!! looks beautiful! Can you come cook for me?! You mean… cooked ramen??!?!?! I could never dream of such luxury! Ihihihihih 🙂 Well, I’m pretty good at cooking but I wish I could draw like you do! I love drawing, but I’m always ashamed when it comes to show my creations to people… Maybe we could teach each other! Your sight is beautiful! From Fashion to Food, it is a joy to read. Thank you so much for following my blog and letting me share in yours. Many thanks to you, you’re very kind! Pingback: 10 easy steps to cook perfect pasta | KIMOMO Lab. 🙂 So I decided to come and checked your blog out! This is one of my favourite! I love pesto! I’m gonna try it! Do it, it is as simple as delicious! And let me know how it goes, though I’m sure you’ll enjoy it 🙂 Thanks for dropping by!